Patti Sanchez, Duarte’s Chief Strategy Officer, writes books, creates frameworks, and helps clients connect with audiences through persuasive presentations and story-based communications. She is the co-author of the award-winning book, Illuminate: Ignite Change Through Speeches, Stories, Ceremonies, and Symbols. Patti leads an expert team of communication consultants and creative writers who help clients move their audiences in one powerful moment or in a movement over time. Applying insights from more than 25 years of communication experience, Patti helps leaders and persuaders understand the inner workings of the human mind and heart and then use that knowledge to craft engaging narratives that cut through the clutter and resonate on a deep level. Patti packages her expertise into inspiring and educational keynotes for executives, entrepreneurs, and marketing and communication professionals. She teaches them to lead movements, use storytelling as a strategic tool, and harness the power of presentations as a persuasive communication platform. She has delivered highly rated presentations at conferences and events including Khosla Ventures CEO Summit, The CEO Alliance, Vital Speeches CEO Communications Summit and Leadership Communication Days, IABC World Conference, HBR, Marketing Profs, Salesforce ExactTarget Connections, Invent Your Future, WATT, CASRO, and Presentation Summit. Patti also delivers custom keynotes, addressing corporations such as Facebook and Google as well as higher-education institutions such as Stanford and Rice University. Her work has been honored by IABC, BMA, Vital Speeches of the Day, and Axiom. 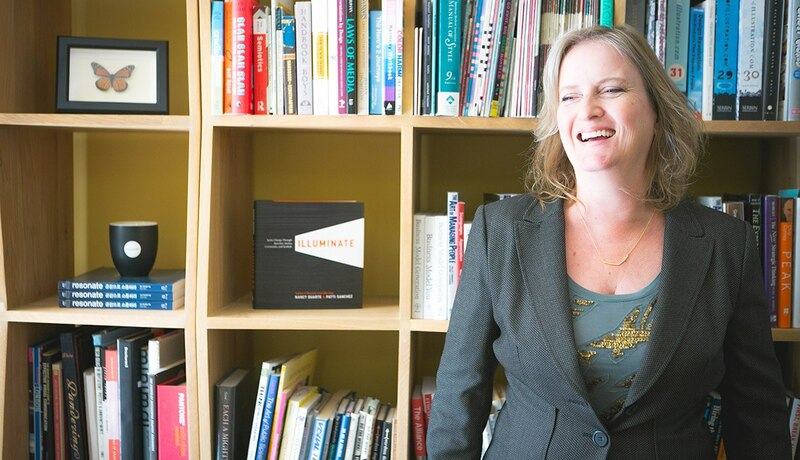 Ignite Change Through Speeches, Stories, Ceremonies, and Symbols – Building on insights from her award-winning book Illuminate, co-authored with Nancy Duarte, Patti delivers a keynote that’s sure to encourage leaders, entrepreneurs, and communicators to dream big. This popular keynote is equal parts inspirational and practical, combining fascinating research about the secret structure of movements with a comprehensive toolkit of communication techniques used by the world’s great leaders. Audiences will leave with a new perspective they can apply to make their own initiatives more successful and renewed confidence that they, too, can play a part in changing the world. Create Impactful Events That Move People – In this 30-minute presentation, Patti inspires marketers, event planners, and anyone else who curates gatherings to reimagine their role in communication. She’ll highlight research that explains why shared moments leave an impact on audiences, outline a framework for concepting and planning impactful events, and share examples from Duarte’s innovative work with leading brands. Harness the Power of Presentations to Spread Ideas – This practical 30-minute talk explains why presentations are the “lingua franca” of business today and how organizations can get the most out of their presentations by leveraging their slides in multiple ways. Patti shares trends in presentations and how they can be used for maximum impact by everyone from executives to marketers and salespeople to subject matter experts who want to spread their ideas inside and outside their organizations.